The body has long been an important theme in art, but in recent years somaesthetics has increasingly emerged not only as a way of understanding contemporary art forms (especially body art, performance, installation) but also as a perspective for enriching art-historical discourse and criticism in both Western and Asian cultures. By providing important insights into the embodied creative process and interaction between the viewer and artwork, somaesthetics can illuminate aspects of our artistic tradition whether of the Renaissance and Baroque periods or the classical Asian forms of calligraphy and inkwash painting. When somaesthetics is introduced into the world of art and art scholarship, it opens up “the golden cage of autonomous art”, providing room for a wide and dynamic range of interdisciplinary perspectives and research approaches. Many fine contributions have already discussed the somaesthetics of visual art (which somaesthetics shows to be more than merely visual), but there remain many important topics that require more study. 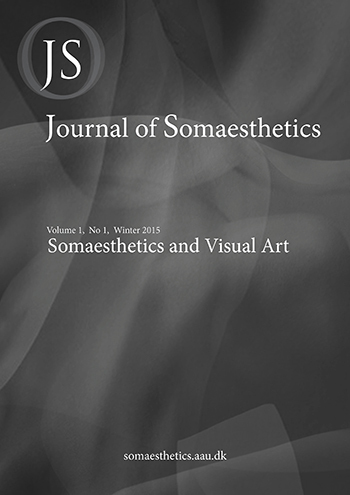 This first issue of the Journal of Somaesthetics, seeks to make a useful step in the systematic and collaborative study of the soma’s role in visual art. We hope that this will stimulate further contributions in this Journal and elsewhere.